The Lake District is famous the world over for its beauty and cultural history. 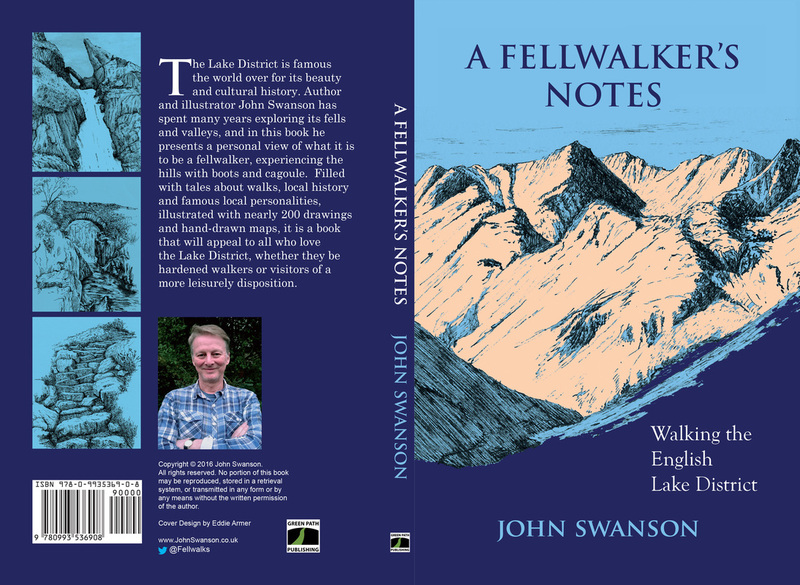 Author and illustrator John Swanson has spent many years exploring its fells and valleys, and in this book he presents a personal view of what it is to be a fell walker, experiencing the hills with boots and cagoule. Filled with tales about walks, local history and famous local personalities, illustrated with nearly 200 drawings and hand-drawn maps, it is a book that will appeal to all who love the Lake District, whether they be hardened walkers or visitors of a more leisurely disposition. 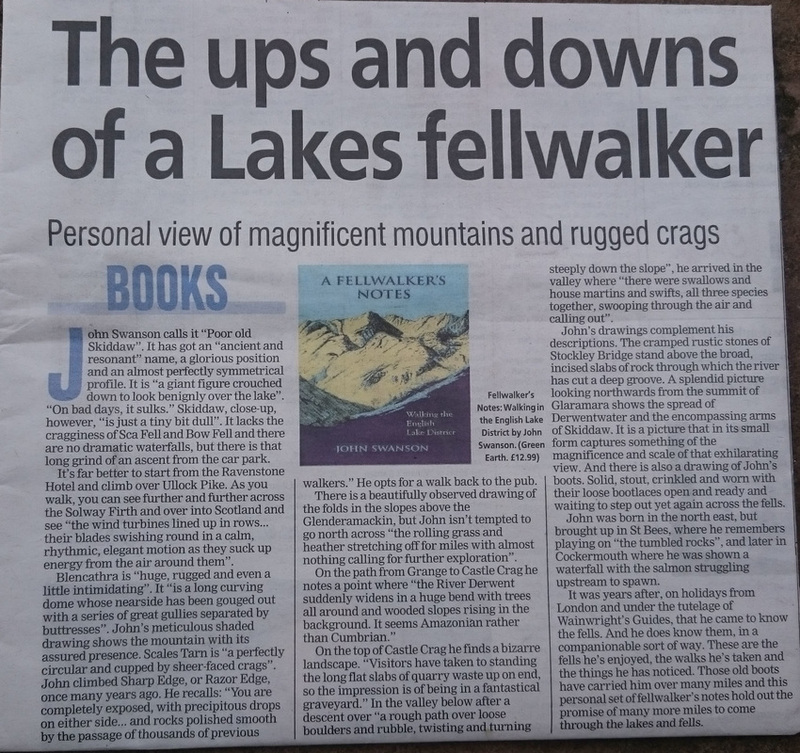 "I have obviously been walking in the Lake District for the last 25 years with my eyes shut"
​The book has been getting good reviews from readers on Amazon. Here are four five star reviews. The book has twelve chapters, 216 pages, 185 drawings and eleven hand-drawn maps. I divided the Lakes into ten areas, and gave each its own chapter. Despite having explored the Lakes for many years, I went back there over about five years to revisit each location, refresh memory and gather new material. This isn't a classic guidebook with point by point descriptions of walks. I've described many walks, but I've also written about other things that caught my interest and that I hope will interest readers. ​And each chapter is fully illustrated with drawings of views and maps, and curiosities. The drawings are pen and ink (all but one) sometimes with wash (diluted ink painted on with a brush). Many were done on the spot, but the Lake District weather isn't always kind to would-be artists, especially at high altitudes, so many were done at home based on photographs and quick sketches. You can see some of them here. You can buy from this site here or from Amazon. The retail price is £12.99 (including P&P in the UK if bought from this site). Plus, it's now available on Kindle, so you can download a copy instantly. If you don't have a Kindle just install the free Kindle App and there you have it - Kindle on your smartphone. All the walking, drawing and writing was my own work. However I'd like to acknowledge help from two people. First is Eddie Armer, who encouraged me to write the book after seeing some early drawings and hearing my vague ideas about writing a guide. He also created the cover design, based on one of the drawings (Grisedale, seen from Birkhouse Moor, on page 111). Second is my editor, Georgia Laval, who fixed errors and made many improvements without altering the sense of it being my 'voice'.